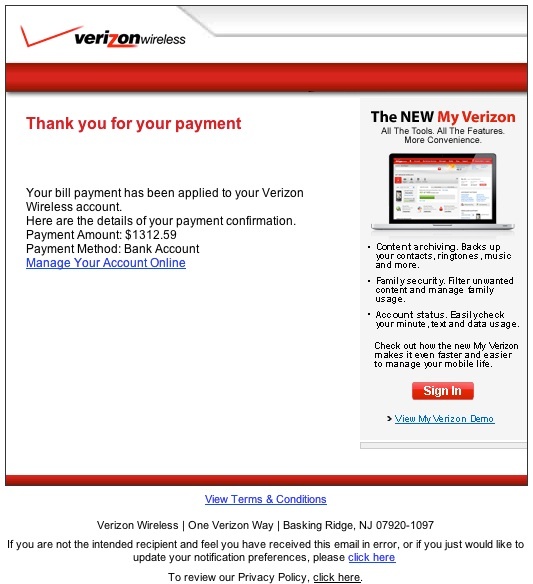 Be on the look out for an e-mail phishing attempt using an email that pretends to be from Verizon Wireless. Actual fake email with links to a spoof website in Europe and unusually high balance. Phishing emails usually display well-known brand names such as Chase Bank, credit companies, or Verizon Wireless. The deceptive emails are called “spoof emails” because they fake the appearance of a popular website or company. The emails often request that the recipients update or confirm their personal information, such as credit cards requests for automatic credit card payments. Links may be provided to a website that may also display the company logo or other recognized elements of the company. The email will attempt to scare you with a large account balance or a warning that someone has recently updated your account, to get you clicking links without thinking. If a recipient hovers the pointer over the link, the link will show an unknown web address — often from Hungary (domain suffix .hu), Czech Republic (domain suffix .cz), Russia (domain suffix .ru) or other country domain suffixes. Some emails will attempt to deceive users with the threat that their account are in jeopardy. Users are urged to update information as soon as possible. Again the key giveaway is text in a link that may look valid, but sends users to a “spoof” address. Users should check where a link is going before clicking. Users can do this by hovering a mouse pointer over the link and looking at the URL on the browser or status bar. If it appears suspicious, don’t click on the link. For example, if the email appears to be from Verizon Wireless, but the link doesn’t have verizonwireless.com characters and/or you recognize a foreign domain suffix, just trash the email. If you clicked on a link, its a good idea to run a computer security scan. Harmful programs, viruses, or trojans can be downloaded to a users computer hard drive just by visiting a spoof site.